Many companies h ave leapt on the Social Networking bandwagon as part of their marketing and public relations strategy. They have staff for whom posting on things like Twitter and Facebook is a major part of their day. Why wouldn’t you? It’s an easier way of getting information out to, and interacting with, your customers (and potential customers). Airlines have been fairly quick to catch on to this – it’s a great way of rapidly disseminating service info during disruption, and collecting rapid feedback from pax. 1) Speed of contact and response – this was quicker than sending email, or probably trying to phone someone up in UAL to let them know this was happening. Getting the message to the right person isn’t always easy. The Social Media team can act as a rallying point for this info. 2) The positive response from the UA Twitter scribe – “This will be followed up today” – does a lot to show that someone in what could otherwise be percieved as a large, faceless, inaccessible, uncaring corporation, does give a damn, that the user can get their attention, and get something done. 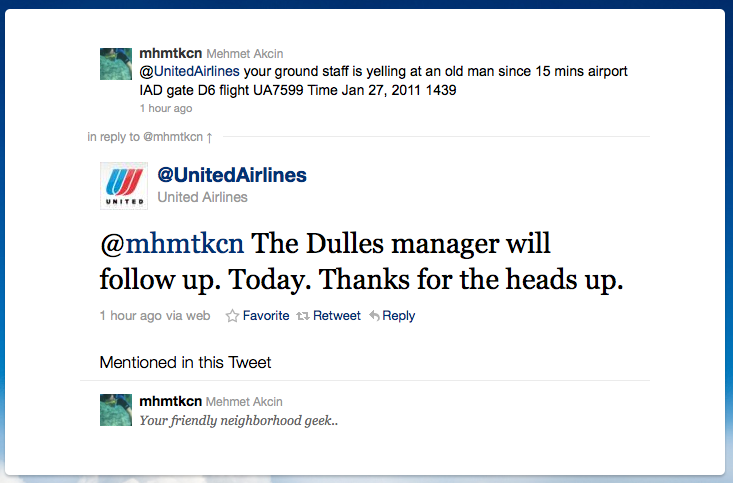 This simple action shows how social networking can bridge the communications gap that often exists between large companies and it’s clients, and does a lot to raise UA’s kudos amongst those who saw the message.